and serve as training data for developing HRTF models. Publicly available databases provide measured HRTFs for many human subjects and mannequins. However, few such databases also include corresponding morphological data. Consequently, the 3D3A Lab is measuring HRTFs and corresponding 3D morphological scans of subjects, which we provide as a freely available database. Below, the measurement and processing procedures are described for the HRTFs and morphological scans. The figure below illustrates the HRTF measurement setup in the anechoic chamber. Briefly, the subject is seated in the chamber in front of a vertical arc, which holds 9 loudspeakers. Binaural microphones are inserted into the subject's ears, and binaural impulse responses (BIRs) are measured for each loudspeaker. 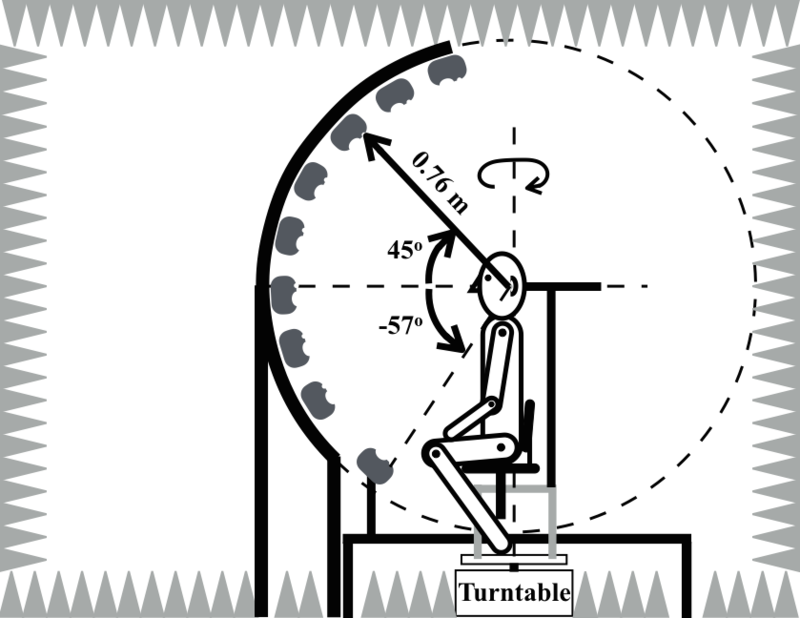 The subject is then rotated in 5° increments using a computer-controlled turntable upon which the seat is affixed. The HRTF measurement procedures are described generally in this video by Michael Lavorgna, and in more detail in this paper. The table below summarizes information about the HRTF measurements. To acquire the subject's HRTFs, the measured BIRs must be equalized by reference impulse responses (RIRs), in order to remove the loudspeakers' and microphones' responses. 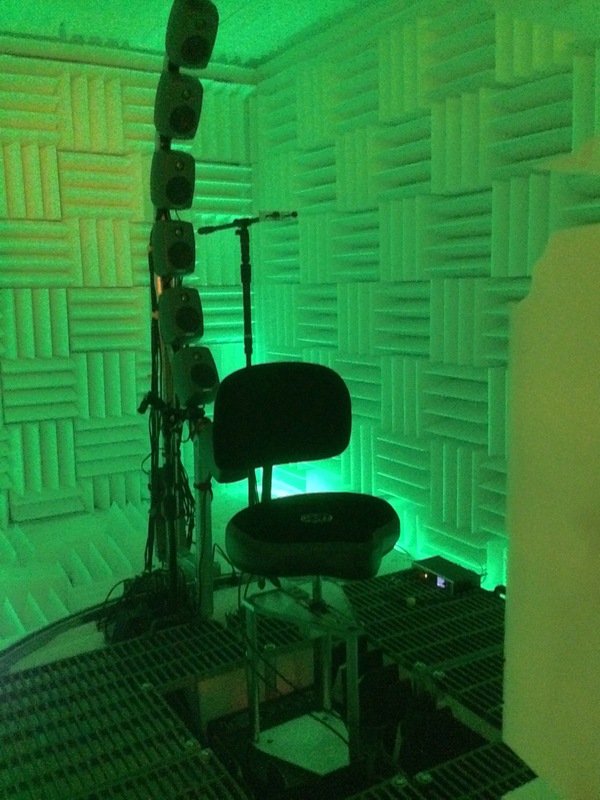 The RIRs are measured for each loudspeaker using the same binaural microphones, which are placed at the origin of the measurement arc (i.e., at the position of the center of the subject's head). Inverse filters for the measured RIR's are then designed and applied to the BIRs, yielding the equalized HRTFs. The HRTF processing is described in more detail in this paper. The diagram below illustrates the morphological scanning setup. 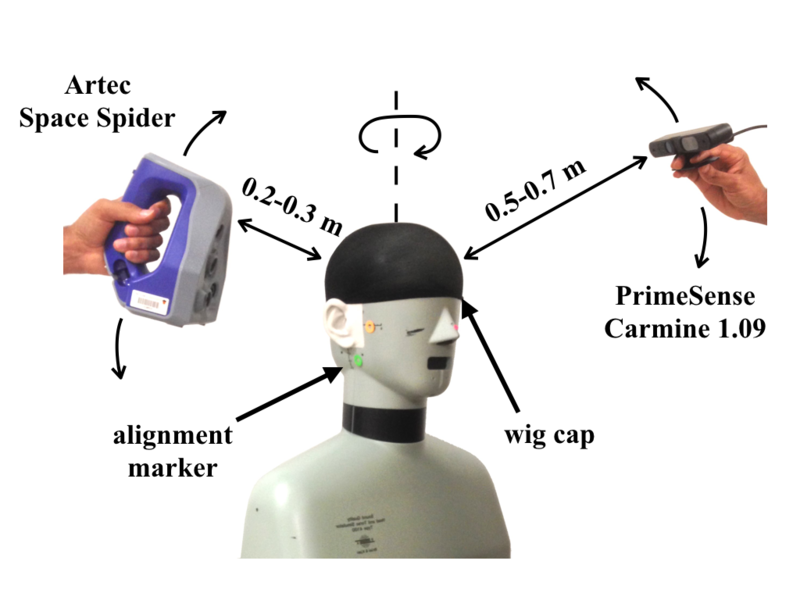 Briefly, the subject is seated, puts on a wig-cap, and has colorful adhesive markers placed around the subject's face. The subject's head and torso are then scanned using a “consumer-grade” 3D scanner, followed by a high-resolution scan of the individual pinnae using a state-of-the-art, structured-light, 3D scanner. The morphological scanning procedures are described in more detail in this paper. The table below summarizes information about the morphological scans. The consumer-grade head-and-torso scans are then converted into watertight meshes and aligned such that the subject's interaural axis coincides with the y-axis of the scan. A copy of each of these scans is then made, following which the “consumer-grade” pinnae scans are manually replaced by the corresponding high-resolution pinnae scans, yielding the “reference-grade” scan. The morphological scan processing procedures are described in more detail in this paper. Important Note: If any of the data provided in this database are used for research resulting in published academic work, please cite the publication listed below.